Baked Chicken Parmesan Meatballs have all the ingredients of this family favorite recipe neatly packaged into meatballs that can be served over spaghetti, in a sub roll…or as a tasty appetizer dipped in marinara. Mozzarella cheese, Parmesan cheese, breadcrumbs, marinara sauce, egg and basil plus ground chicken. Yep. These meatballs really do have every single ingredient you would find in a traditional Chicken Parmesan recipe. Except, they’re not traditional at all and they’re easier to make. Just mix the ingredients together and shape them into balls. 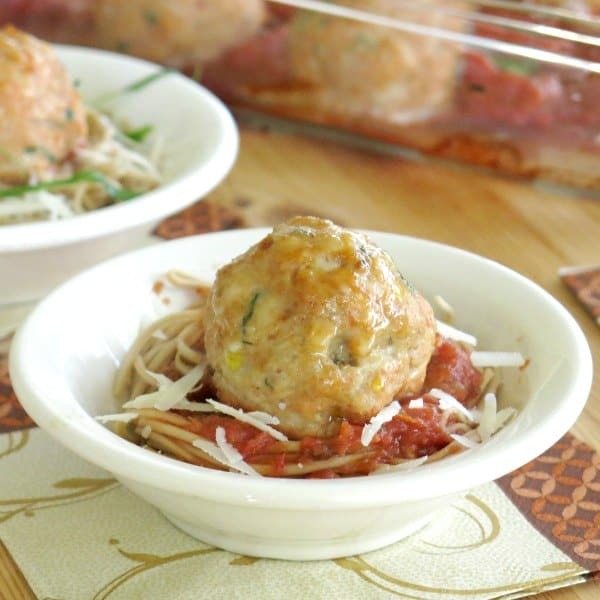 Or try the “cheater” method like we did for Easy Chicken Meatballs Baked in a Muffin Tin. When you eat them, dinner feels new and exciting. If you’re a fan of chicken parm, you’ve got to try these! Just like the closely-related, Gourmet Meatloaf and Turkey Meatloaf Muffins, Baked Chicken Parmesan Meatballs freeze well…really well. So, you know the mantra…make lots and freeze the extras and you’ll always have a delish 5:00 p.m. Dinner Plan. 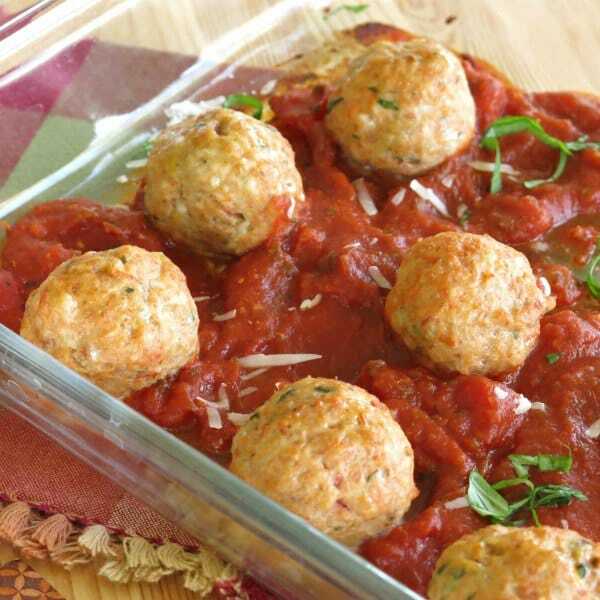 For a traditional spaghetti and meatball dinner, bake the ground chicken meatballs on top of the sauce right in the baking dish and serve. It’s almost a one pot meal, except you’ll need to mess up another pot to cook the spaghetti. It is, however, a 30 minute meal. Appetizers anyone? 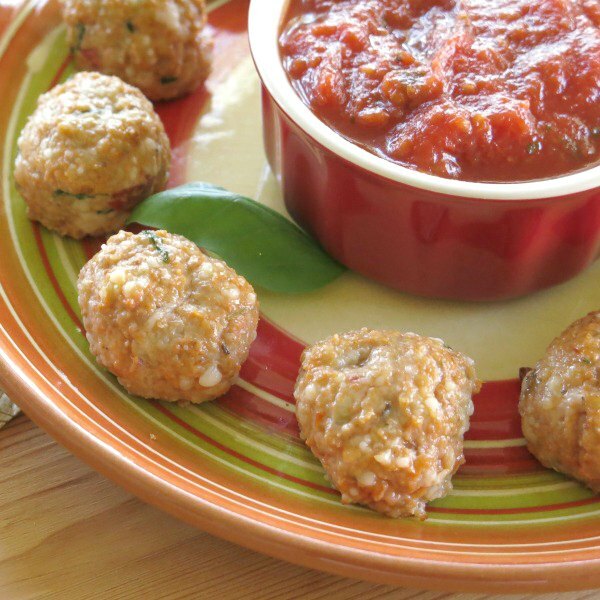 Serve meatballs with a side of marinara for dipping to guaranteed applause. I also call this my kid-friendly version because who doesn’t like to dip?! We made the meatballs below on the small side by using about a heaping teaspoon of the meat mixture. Or, make one big meatball, which could easily be baked in a cupcake tin like Buffalo Chicken Meatloaf Cups. I’m always inspired to make an eye out of an olive and place it on top for Halloween! In a submarine sandwich. Top with pasta sauce and mozzarella cheese. In a pasta bowl with roasted vegetables, like zucchini and mushrooms. 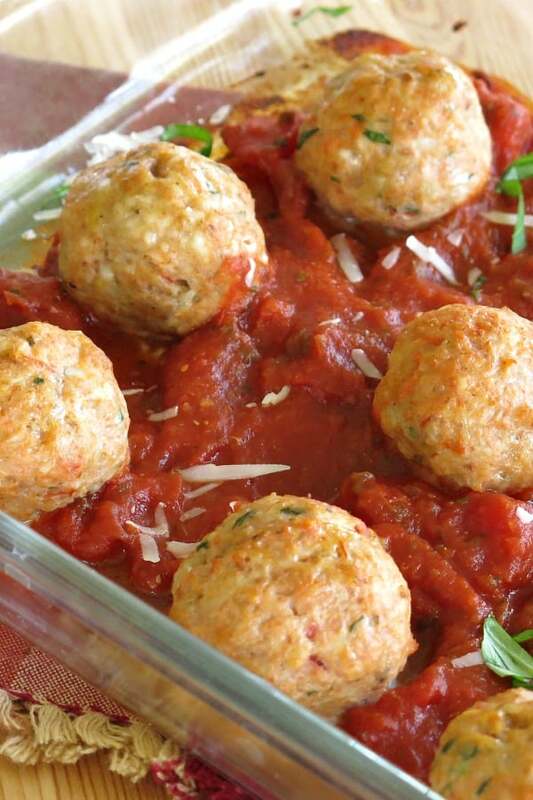 I hope you get the picture…there are lots of ways to enjoy these Baked Chicken Parmesan Meatballs! Prepare and bake the meatballs. Freeze the cooked meatballs on a baking tin and then transfer them to a plastic bag that seals. When you are ready to enjoy the meatballs, lift the amount you want out of the bag and re-heat. Place them on a microwave safe plate and cook on high for about 2 minutes. Check and turn them slightly and cook at additional 30 second intervals until heated through. Prepare the meatballs, but don’t cook them. Freeze the uncooked meatballs. Again, place them on a baking tin in a single layer until solid, then move to a plastic bag. When you are ready to cook them, remove the amount needed and defrost in a single layer in the refrigerator (preferably overnight.) Place them on a baking sheet or glass baking dish and then cook the meatballs as you normally would. Baked Chicken Parmesan Meatballs have all the ingredients of this family favorite recipe packaged into tasty meatballs! Add all of the ingredients (only 1/3 cup marinara sauce), except for the chicken, to a large bowl and thoroughly combine. Add the ground chicken to the bowl and combine. Form mixture into Tablespoon-sized balls. Pour remaining marinara sauce in the bottom of a glass baking dish. Place formed meatballs on top of the sauce. Bake uncovered for about 15 minutes or until chicken is cooked through and no longer pink. Serving suggestions: For an appetizer, scoop marinara into a bowl and serve alongside meatballs and toothpick. Or, serve over spaghetti noodles or in a sub roll with more cheese and marinara sauce. Meatballs can be made ahead of time and frozen raw. Or cook and freeze. Meatballs can be made larger, however the cook time will be longer. Can also be baked on a cookie sheet coated with cooking spray. Ha ha ha…love your spookified version! My kids would crack up (and think I’m cool 😉 ) My kids would love these meatballs in general. Great dinner idea! Haha I love your little spooky meatball 🙂 It’s perfect for Halloween! I adore how versatile these are! Oh, these sound so delicious! I’m thinking a meatball sub would be fantastic with these. 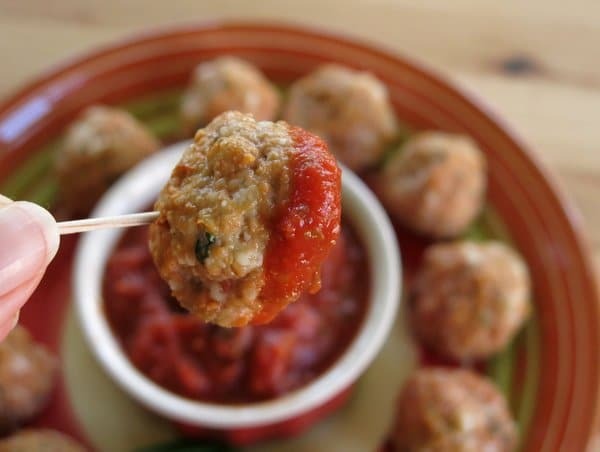 I love just about any meatball I meet – however chicken meatballs are my favorite…delicious!! These look so lovely, stumbled and pinned. YUM!! Wow. That’s MY kind of recipe. Hearty, healthy, and I know … delicious. My boys would devour that 🙂 Can’t wait to share this on Pinterest. Cracking up at your spooky meatball 🙂 He’s a cutie! This recipe is so smart… I can’t wait to try it! I am majorly drooling here. Chicken parm is my favorite but as meatballs?! yes, please! These meatballs look and sound wonderful! I’ll definitely be trying them out soon, I love the idea of them as an appetizer! Love the eyeball version for Halloween! Love the spookiefied version of these meatballs – so cute! These meatballs look incredibly good! Thanks for sharing! That looks absolutely delicious-I LOVE meatballs! Pinning! The spooky version is so neat!! What a cool idea!! This has comfort food written all over it. Love it!! Love these meatballs! What a great idea and so simple. I, especially, love the spookified cyclops version! Love the cyclops too. So funny. My boys would love that. Such a fun idea. These look insanely good. I want to eat 10 then come back for more. These Meatballs look absolutely delicious! I can’t wait to try these! Love the parmesan twist on these, such a great addition! These meatballs look so juicy! And they’re baked, which is even better! Chicken Parm is my fave, so this recipe has catapulted to the front of the line. Seriously….YUM! My family will surely love this!